Our pharmacists are certified to give vaccinations for the flu, shingles (Shingrix), pneumonia (Prevnar 13 and Pneumovax 23), Tdap (Boostrix), and more! Good Value Pharmacy has pharmacists that are certified to provide vaccinations. There is no appointment needed so you can just come in at your own convenience! Feel free to call or stop by if you want to speak with a pharmacist about a vaccine. Below are some frequently asked questions about 3 of the more common vaccines administered by pharmacists. The influenza virus causes a contagious disease spread by coughing, sneezing and nasal secretions. Symptoms of the disease include fever, chills, muscle aches, fatigue, cough, runny nose, headache, and sore throat. For most people, symptoms last between 3-5 days. However, for some people, especially young children, elderly, and those with weakened immune systems, the disease can be much worse. Thousands of people die each year and even more are hospitalized from complications of the disease. The flu vaccine reduces your chances of getting sick with the virus by 60-70 percent. The Advisory Committee on Immunization Practices (ACIP), which is part of the CDC, recommends that all people above 6 months of age without contraindications get vaccinated every year before flu season, which starts in the fall and peaks in January and February. Pharmacists in Wisconsin cannot vaccinate children under the age of 6 years. What are the risks of getting vaccinated? 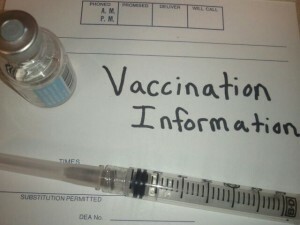 The vaccine virus is inactivated, so you cannot get sick with influenza from the vaccine. Most people do not have any side effects from the vaccine. Sometimes people have reactions such as swelling, pain or redness near the injection site, fatigue, fever, and headache. These reactions are mild and will resolve in a day or two. Severe reactions to the vaccine are extremely rare. Contact your doctor or pharmacist if you have any questions. Who should not get the influenza vaccine? Talk to your physician or a Good Value Pharmacist if you have questions about situations in which one should not receive the influenza vaccine. Pneumococcal disease is caused by Streptococcuspneumoniae bacteria. Anyone can get the disease, but certain people are at more risk than others. People 65 years and older, infants, people with certain health problems, people with weakened immune systems and smokers are at increased risk. This bacteria can cause serious infections of the lungs, blood and brain. The bacteria kills between 5 and 20 percent of people who get these infections. Who should get vaccinated with PCV13? Adults who are 65 years of age or older and who have not previously received PCV13, should receive a dose of PCV13 first, followed 12 months later by a dose of PPSV23. If you have already received one or more doses of PPSV23, the dose of PCV13 should be given at least 1 year after you got your most recent dose of PPSV23. Who should get vaccinated with PPSV23? Anyone 2 through 64 years of age who has a long-term health problem such as: heart disease, lung disease, sickle cell disease, diabetes, alcoholism, cirrhosis, leaks of cerebrospinal fluid or cochlear implant. Anyone 2 through 64 years of age who has a disease or condition that lowers the body’s resistance to infection, such as: Hodgkin’s disease; lymphoma or leukemia; kidney failure; multiple myeloma; nephrotic syndrome; HIV infection or AIDS; damaged spleen, or no spleen; organ transplant. Anyone 2 through 64 years of age who is taking a drug or treatment that lowers the body’s resistance to infection, such as: long-term steroids, certain cancer drugs, radiation therapy. Any adult 19 through 64 years of age who is a smoker or has asthma. Residents of nursing homes or long-term care facilities. In most of the above cases, PCV13 should be given first, then a dose of PPSV23 should be given at least 8 weeks later. Do I need a second dose? Usually only one dose is needed, but under some circumstances a second dose may be given. A second dose is recommended for people 65 years and older who got their first dose when they were younger than 65 and it has been 5 or more years since the first dose. When a second dose is given, it should be given 5 years after the first dose. Adults who received one or two doses of PPSV23 before the age of 65 should receive one final dose of the vaccine at age 65 or older. About half of people get mild side effects like redness or pain at the injection site. Less than 1% of people experience reactions such as fever and muscle aches. Serious reactions are possible but extremely rare. Who should not get vaccinated with PCV13 or PPSV23? Talk to your physician or a Good Value Pharmacist if you have questions about situations in which one should not receive a pneumonia vaccine. Shingles is a painful skin rash that often blisters. It usually appears on one side of the face or body and can be very painful. It lasts usually lasts 2-4 weeks but in about 20% of people the pain persists even after the rash goes away. This is called post-herpetic neuralgia. Shingles is caused by the Varicella Zoster virus, which is the same virus that causes chickenpox. Only someone who has had chickenpox-or rarely, had the chickenpox vaccine- can get the disease. Shingles is most common in people older than 50 years old and in people with weakened immune systems. At least 1 million people per year get shingles in the United States. The CDC recommends adults over age 50 receive 2 doses of Shingrix spread out by 2-6 months. Even people who have been vaccinated with Zostavax in the past should receive Shingrix to prevent shingles and complications caused by the disease. The vaccine reduces your chance of getting the disease by over 90 percent. There are some cases in which someone should not get the Shingles vaccine. Talk to your doctor or pharmacist before getting the vaccine. About 1 in 3 people have mild local reactions like redness or swelling and about 1 in 70 people get a headache. No severe problems have been identified. Please call today for prices or to see if your vaccination is covered under your insurance! Nothing herein constitutes medical advice, diagnosis or treatment, or is a substitute for professional advice. You should always seek the advice of your physician or pharmacist if you have questions or concerns about a vaccination.